Review: Between 2014 and 2017, DJ Slyngshot's Yappin label delivered some of the most interesting, off-kilter dancefloor excursions around. 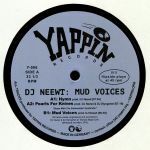 The imprint has been dormant since, so it's great to see Slyngshot bring it back to life via this 12" from close pal DJ Neewt. There's something particularly inspired about opener "Hymn", where an increasingly intense acid bassline, raygun electronics and trippy electronic motifs wrap around a skewed breakbeat groove. Slyngshot joins in the fun on the deep, tribal and quietly psychedelic thump of "Pearls For Knives" - all dense drums, dub delays and mind-altering motifs - before Neewt finishes things off via the meandering lo-fi synth lines and chugging deep house grooves of "Mud Voices". It's good to have Yappin back, that's for sure.